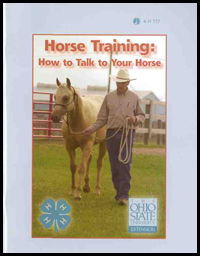 These videos support the Ohio 4-H project Horse Training: How to Talk to Your Horse. They are the same ones included on the CD in previous editions of the project book. The videos feature Dr. Robert C. Kline, the author of the project book and former OSU horse specialist. At the time the videos were recorded, Dr. Kline had over 40 years of experience training horses and studying training methods. He demonstrates these methods with a yearling filly and a two-year-old stallion that have limited training. For the horseperson, training should be a lifetime commitment. This video is just a starting place to help you understand and train horses.